Twenty-year-old Abdirizak Mohamed Warsame entered his plea at a hearing Thursday in U.S. District Court, Feb. 11. 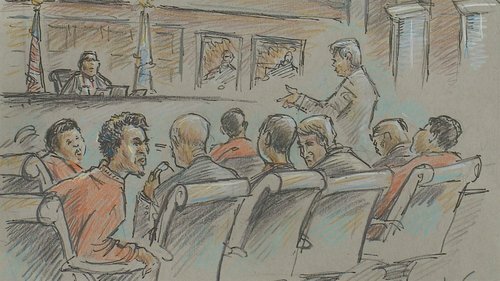 An experiment on how to punish those seduced by ISIS played out in a Minnesota courtroom, as a federal judge who has embraced a deradicalization program handed down a wide range of sentences to nine terrorist recruits — from time served to 35 years. Judge Michael Davis released one young Somali-American man who already has spent 21 months into a halfway house. But others who were part of the plot to become ISIS fighters in Syria got far harsher sentences of several decades. Karen Greenberg, director of the Center on National Security at Fordham University School of Law, said Davis' nuanced approach to the sentences broke with the traditional throw-the-book-at-them framework of terrorism cases. "There's never been an attempt to see the gradations," she said. "What we're really seeing is terrorism cases finally beginning follow the pattern we see in other cases," Greenberg added. "The cooperator gets the best sentencing deal; those who go to trial are going to get the most punitive deals."